Marketers are finally starting to regain control of their ecosystems. 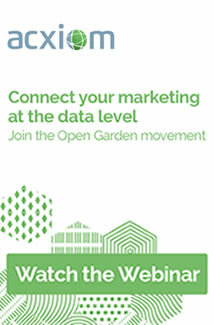 It’s all thanks to the Open Garden – a new blueprint for a marketing and advertising ecosystem that’s connected at the data layer. Open Garden is growing into an unstoppable movement that is allowing marketers to better manage and control their data, using it to drive more-informed analysis and more meaningful, more relevant interactions in every channel. Watch this webinar hosted by Dennis Self, President and General Manager of Acxiom Marketing Services. Hear from top marketers and industry experts on how Open Garden is changing the game, how it can work for you – and how you can start building your own. Join the Open Garden movement.